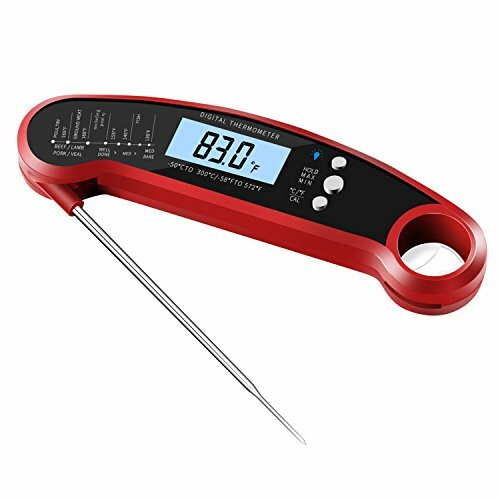 【Instant & Accurate】 The digital thermometer measures within 2-3 seconds. Accuracy: ±1℃(±2℉) at -20℃-150℃（-4℉-302℉），±2℃(±4℉) at 150℃-200℃（302℉-392℉0, beyond 2℃(4℉) at the other ranges. 【Automated Design】Unfold the probe to turn on, fold it to turn off. The thermometer will automatically turn off after 10 minutes if forget to fold. The large bright with backlit light is automatically turned off. 【Multi-Function】 The digital thermometer can work properly for a short time in water, waterproof level up to IP67, making it easy to clean. The built-in magnet makes it possible to attach on the fridge or other cooker's surface. 【Safe Material】 Using food-gradeed stainless steel security probe, probe has been cleared by the FDA and EU Regulation (EC) . 【High Quality】 The shell uses flame retardant, heat-resistant, shock-resistant, environmental-friendly ABS material, won't melt under high temperature, won't break when falling from high. If you have any questions about this product by Smileto, contact us by completing and submitting the form below. If you are looking for a specif part number, please include it with your message.